Let’s start our virtual trip into the so called Imperial Ravenna, one of the most beautiful town in Romagna. Approaching the Mausoleum of Galla Placida and its world-famous, beautiful mosaics, the most ancient of Ravenna is magical. The emperor Honorius (who moved in 402 the capital of the ‘western empire from Milan to Ravenna) want this mausoleum to be dedicated it to his sister Galla Placidia. The theme of the mosaics, in fact, is the victory of life over death, according to the funerary building. Cole Porter, who went to Ravenna on its honeymoon, was inspired by the stars of the mausoleum for the famous Night and Day. When: every day from 9 to 19. This octagonal temple is one of the most important monuments of early Christian art in Italy. Not only for the splendour of its mosaics but for full adherence to the canons of Eastern Europe: there are no aisles but a central octagonal plan topped by a painted dome. When: every day from 9:00 to 19:00. Ticket office closes at 18:45. Not to be confused with Sant’Apollinare in Classe is located outside the historic center, 8 km from Ravenna, the Basilica of Sant’Apollinare Nuovo got this name to differentiate it from another city church that bore the same name. Home to the greatest cycle of mosaics in the world, the walls of the nave are divided into three distinct bands of mosaics: the highest beams tells the life of Christ, the central Saints and the Prophets and the lower one portrays the famous Palace of Theodoric. The cancellation of the figure of the Emperor and other characters, covered with white drapes, takes place at a time when the church goes from Aryan cult to Catholic worship. On the opposite wall is portrayed the port of Classe, one of the most important in the Mediterranean during the Roman Empire. When: every day from 9:00 to 19:00. Ticket office closes at 19:00. According to legend, the hot red porphyry which is located on the top floor of the Mausoleum is the same where he died the Emperor barbaric. Because he was afraid of lightning, in a day of storm took refuge in his mausoleum but lightning was hitting him just as he was taking a bath. The slit-shaped cross open in the roof of the Mausoleum, would then came a black horse that would throw nell’Etna! 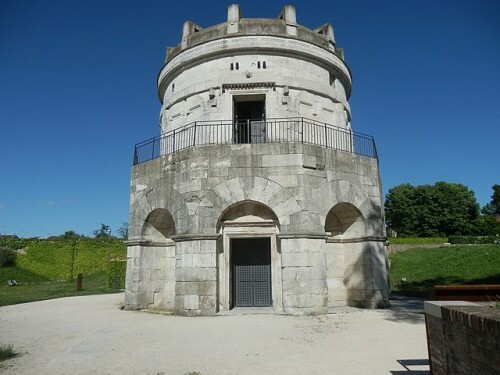 There are many legends about the death of this king Barbarò that ruled Italy for 33 years bringing tolerance, peace and wealth and who built this mausoleum in Istrian stone whereabouts so that peace in Ravenna, where he had lived. The two-story structure shaped decagonal and with a massive roof made from a single block of stone makes it a unique monument, totally different than the brick buildings of Ravenna. Between the basilicas of Ravenna is the most majestic one. The mosaics compete for beauty those of the other churches in the city and portray Christ surrounded by the four Evangelists, while the sheep symbolizing the apostles. Today the Basilica of Sant’Apollinare in Classe is located 8 km from the center of Ravenna and a few kilometers from the sea. Closeby there are the ruins of the great archaeological area of ‘ancient city of class, home of the Roman fleet in the Adriatic. How: by car or bus No. 4 or 5 minutes by train and on foot. When: every day from 8:30 to 19:30. Ticket office closes at 19:00.
the Arian Baptistery of Ravenna was built during the reign of Theodoric, when Ravenna was the capital of the Empire and Arianism was the official religion of the court. Arianism has always been considered a heresy of Christianity because according to the Aryan doctrine Christ was the son of God but retained his human nature: only through the ritual of baptism that the divine nature was communicated to Christ. The mosaics on the vault of the baptistery celebrate their baptism of Christ. Unlike the nearby Orthodox Baptistery, here the young Christ is not represented as coming from the East (“light from light, true God from true God“) but towards the east, becoming divine only in the moment of baptism. The Baptistry of Neon was the Catholic response (the Bishop Neon) to the Arian heresy that in Ravenna had its peak during the reign of Theodoric. This opposition is also found in Christ depicted in the mosaic under the dome, which is divine before baptism.